recolectada en la zona Sur del Macizo Guamuhaya. Hábito. Foto: Ángel Moreira.. Horse Ledge at Shanklin, Isle of Wight, UK. 01 Jul 2011. Roger Herbert. © Roger Herbert (RHerbert@bournemouth.ac.uk). Colonels Hard at Bembridge, Isle of Wight, UK. 01 Jul 2014. Roger Herbert. © Roger Herbert (RHerbert@bournemouth.ac.uk). Mar Menor, Murcia, Spain. 26 Jul 2013. Isabel Rubio Perez. © marmenormarmayor.es. La Azohía, Murcia, Spain. 10 Jul 2014. Isabel Rubio Perez. © marmenormarmayor.es. 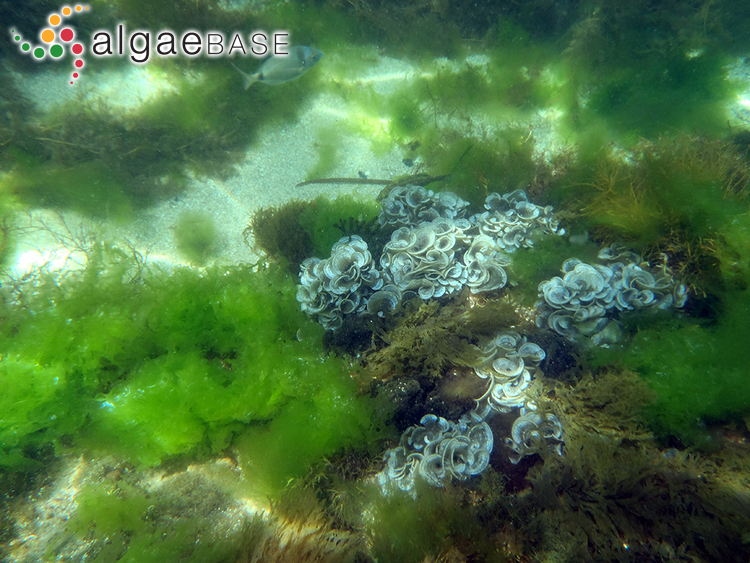 upper subtidal with Zostera marina, Ría de Aldán, Galicia, Spain, 2012. Ignacio Bárbara. © Ignacio Bárbara (barbara@udc.es). upper subtidal, Ría de Pontevedra, Galicia, Spain, 2012. Ignacio Bárbara. © Ignacio Bárbara (barbara@udc.es). Published in: Taylor, W.R. (1960). 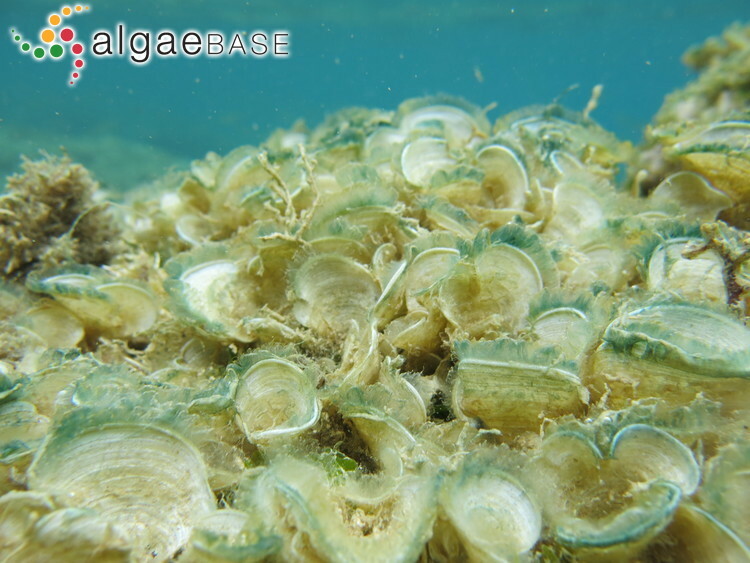 Marine algae of the eastern tropical and subtropical coasts of the Americas. pp. [i]-xi, 1-870, 14 figs, 80 pls. Ann Arbor: The University of Michigan Press. 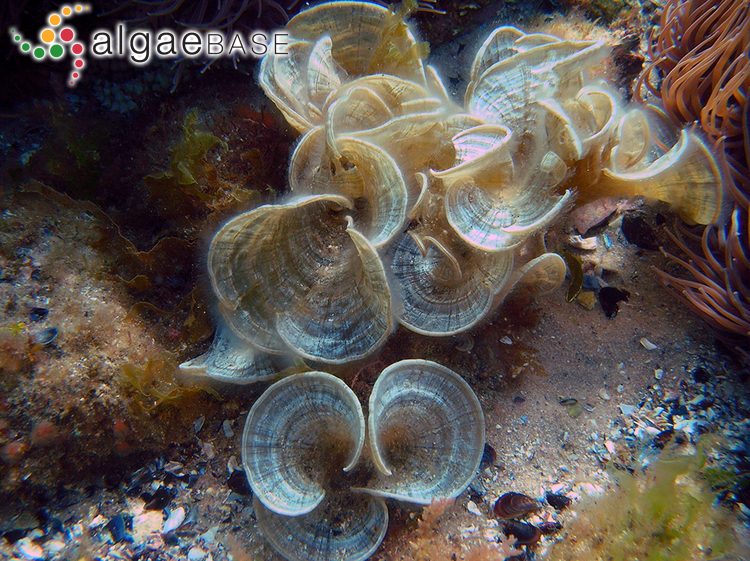 This is the type species (holotype) of the genus Padina. Adjective (Latin), peacock-like (Stearn 1973). 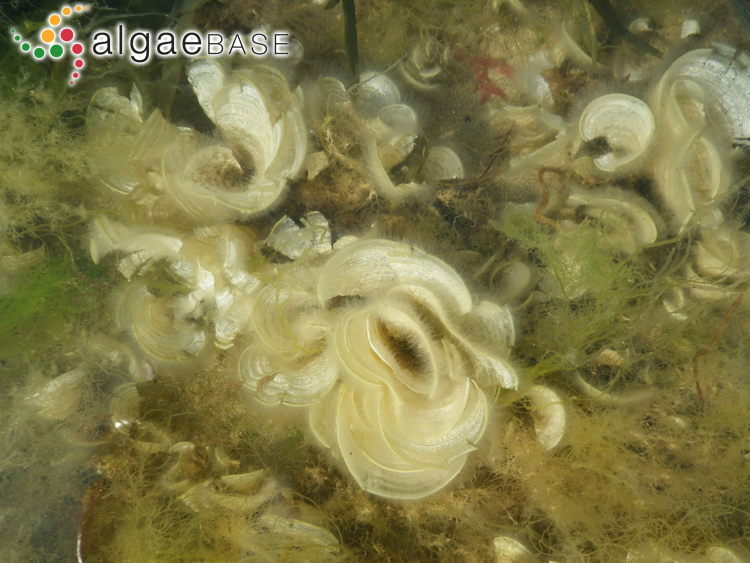 Silva, Basson & Moe (1996, p. 606) consider Fucus pavonius Linnaeus (1759: 1345) an illegimate substitute name for Fucus pavonicus Linnaeus (1753: 1162); others have concluded that the two are orthographic variants. We have followed Silva and his colleagues (Guiry, pers. comm.). See Silva, Basson & Moe (1996) regarding orthographica variants of the specific epithet (Guiry, 1997). There is only a single confirmed Irish record (Cullinane 1970) from the outer reaches of Cork Harbour, where the species has not since been found. "See the general comment in Price et al. (1978) for the doubt concerning the occurrence of Padina pavonica on West African shores." (John et al., 2004). English: Peacock's Tail (Dickinson 1963). English: Peacock's Tail (Bunker et al. 2010). Aisha, K. & Shameel, M. (2010). 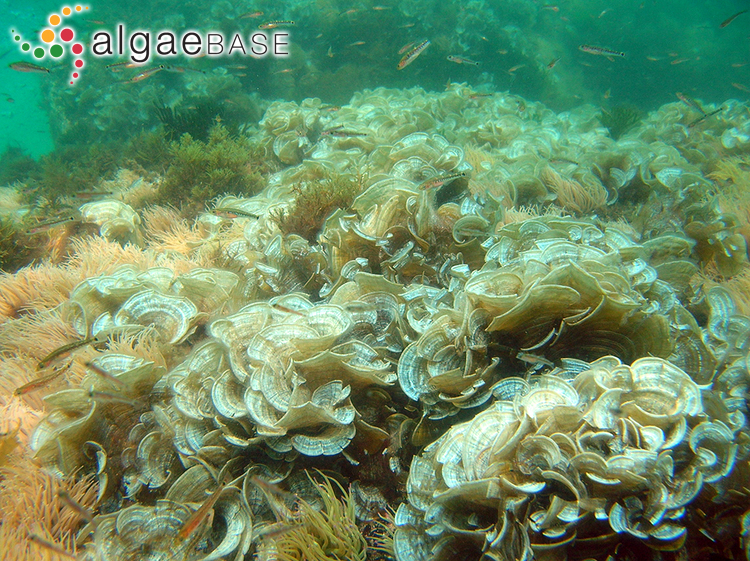 Occurrence of the genus Padina (Dictyophyceae, Phaeophycota) in the coastal waters of Karachi. Pakistan Journal of Botany 42: 319-340. Ni-Ni-Win, Hanyuda, T., Arai, S., Uchimura, M., Prathep, A., Draisma, S.G.A., Phang, S.M., Abbott, I.A., Millar, A.J.K. & Kawai, H. (2011). 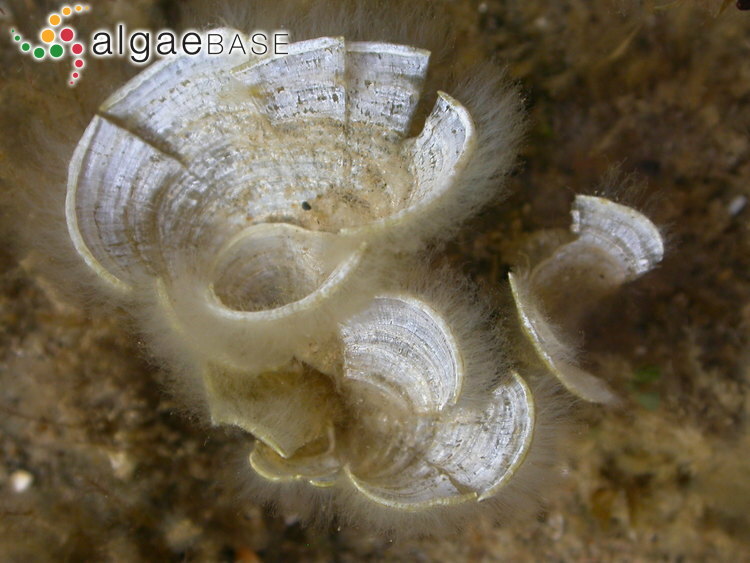 A taxonomic study of the genus Padina (Dictyotales, Phaeophyceae) including the description of four new species from Japan, Hawaii, and the Andaman Sea. Journal of Phycology 47(5): 1193-1209. Nizamuddin, M. (1981). 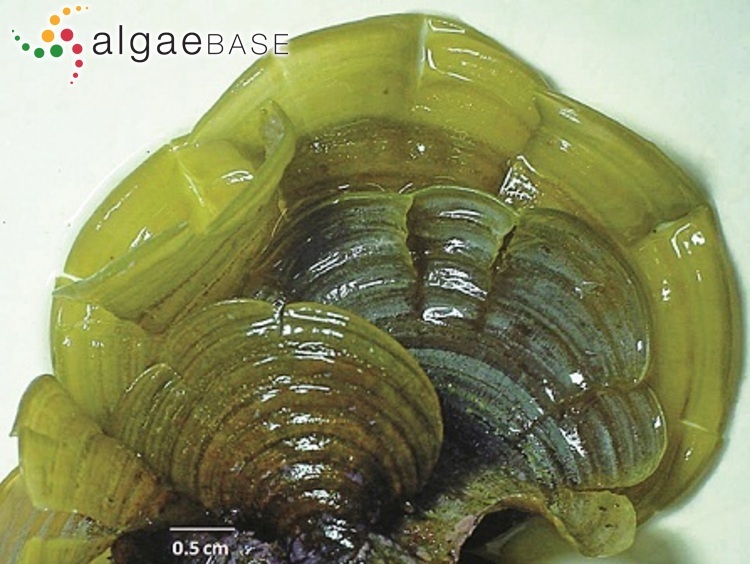 Contribution to the marine algae of Libya Dictyotales. Bibliotheca Phycologica 54: 1-122, pls I-XXXIX, 1 map. Ribero Siguan, M.A., Gomez Garreta, A., Salvador Soler, N. Rull Lluch, J. & Kapraun, D.F. (2011). Nuclear content estimates suggest a synapomorphy between Dictyota and six genera of the Dictyotales (Phaeophyceae). Cryptogamie Algologie 32(2): 205-219. Accesses: This record has been accessed by users 53219 times since it was created. Barceló, M.C., Gómez Garreta, A., Ribera, M.A. & Rull Lluch, J. (1998). Mapas de distribución de algas marinas de la Península Ibérica e Islas Baleares. XI. Lobophora variegata (Lamour.) Womersley, Padina pavonica (L.) Thivy y Zonaria tournefortii (Lamour.) Mont. (Dictyotales, Fucophyceae). Bot. Complutensis 22: 179-186. Bürger, K., Clifford, E. L. & Schagerl, M. (2017). 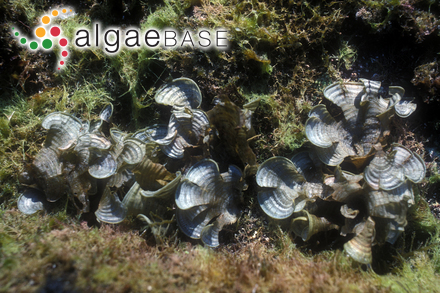 Morphological changes with depth in the calcareous brown alga Padina pavonica. Botanica Marina 60(2): 171-180. Gómez Garreta, A., Rull Lluch, J., Barceló Martí, M.C. & Ribera Siguán, M.A. (2007). 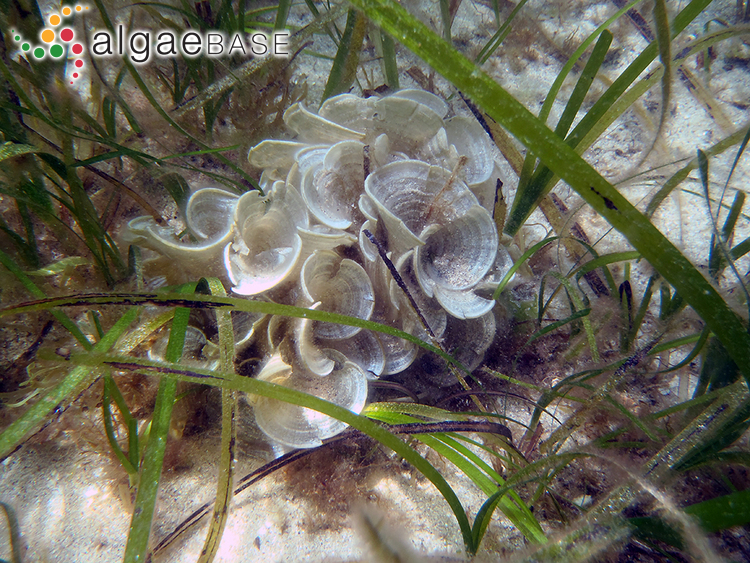 On the presence of fertile gametophytes of Padina pavonica (Dictyotales, Phaeophyceae) from the Iberian coasts. Anales Jard. Bot. Madrid 64: 27-33. Herbert, R.J.H., Ma, L., Marston, A., Farnham, W.F., Tittley, I. & Cornes, R.C. (2016). 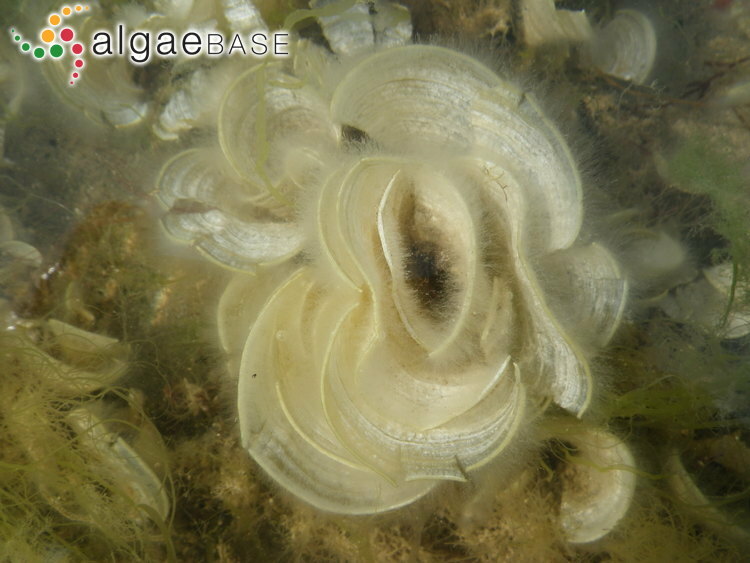 The calcareous brown alga Padina pavonica in southern Britain: population change and tenacity over 300 years. Marine Biology (Berlin) 163(46): 1-15. Häder, D-P., Lebert, M., Mercado, S., Aguilera, J., Salles, S., Flores-Moya, A., Jiménez, C. & Figueroa, F.L. (1996). 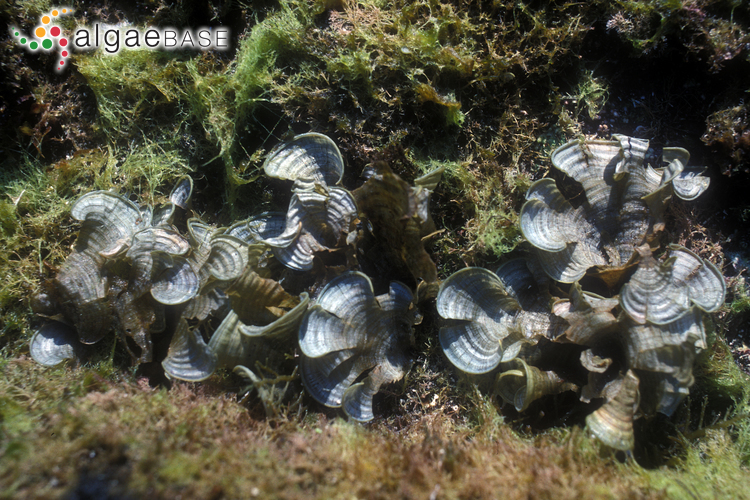 Photosynthetic oxigen production and PAM fluorescence in the brown alga Padina pavonica measured in the field under solar radiation. Mar. Biol. 17: 61-66. Price, J.H., Tittley, I. & Richardson, W.D. (1979). The distribution of Padina pavonica (L.) Lamour. 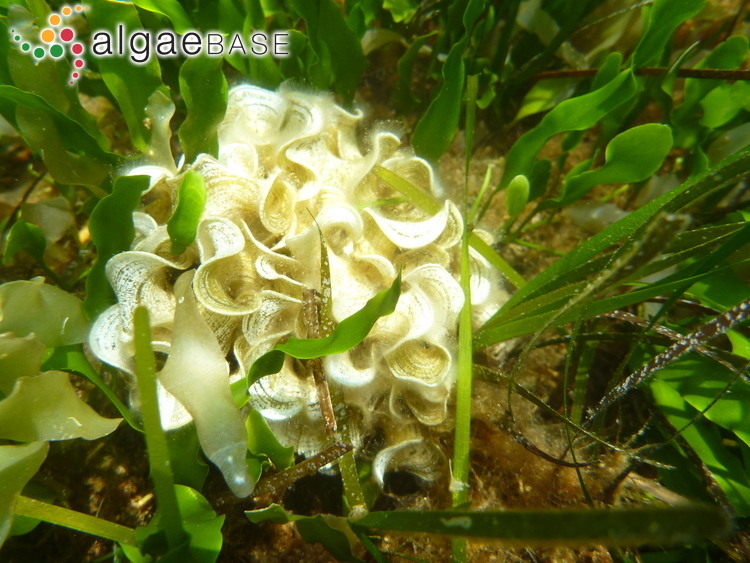 (Phaeophyta: Dictyotales) on British and adjacent European shores. Bulletin of the British Museum (Natural History) Botany 7: 1-67, 2 figs, 3 pls.